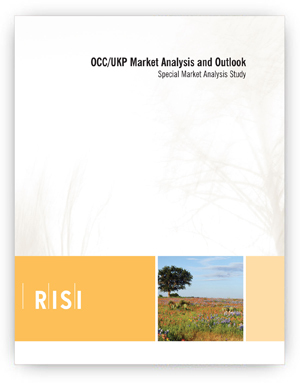 OCC/UKP Market Analysis and Outlook 2015 - Fastmarkets RISI - Objective Insight. Better Decisions. Market shares of kraftliner and semichemical medium, containerboard grades with high virgin fiber content, are expected to decline over the next 15 years. This will reduce the virgin fiber content in the world containerboard sector and greatly impact on the quality of OCC and finished paper/board available. During this period, the demand for OCC will continue to rise due to an expansion in recycled fiber-based containerboard capacity. Though the global OCC recovery rate increased to 87% in 2014, it’s still not high enough to meet future projected demand. This may cause OCC scarcity in coming years, similar to market occurrences in 2011. One of the key factors that will shape the future of the world containerboard sector is how demand and supply for OCC and UKP fiber will be balanced. Massive new containerboard capacity, most of which consists of recycled grades, is planned to start in Asia. There are also graphic paper machines planning to exit the declining European and North American markets. Conversion to recycled containerboard may be an appealing option for these machines. This expansion of recycled fiber-based containerboard capacity will increase the recycled fiber content in the world containerboard sector. This will degrade overall OCC fiber quality, particularly in the regions short of virgin fiber. It will also impact OCC demand, which is expected to outpace recovery in some developing regions. Containerboard producers will have to find a solution for the degradation of OCC quality to maintain the quality of their finished products; likely with a higher mix of UKP. This will have an impact on both OCC and UKP demand/supply balances in coming years. Producers may also face OCC scarcity if recovery rates dont improve to keep pace with demand during this time. 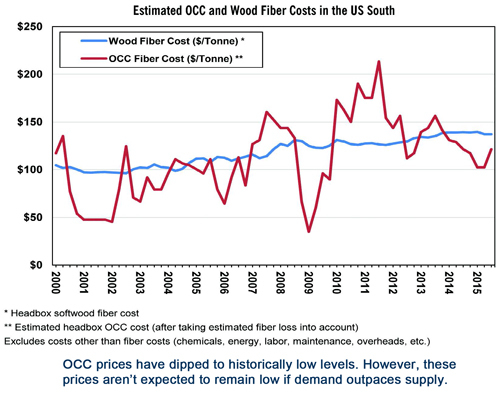 This study combines economic market analysis of recycled and virgin fiber to understand how OCC and UKP dynamics will shape the future of the containerboard sector. Fastmarkets RISI’s economic analysis and mill intelligence teams worked together to provide a comprehensive analysis of this market. It offers an in-depth exploration of key economic factors, as well as detailed cost benchmarking analysis of market leaders. Anticipate and plan for potential changes to raw materials like OCC and UKP. Understand global and regional demand and supply for different grades of containerboard, which may be conversion targets. Gain insight into the future of OCC and UKP markets. Identify where OCC demand growth will come from and find potential customers. Gain insight into the global fiber balance in the world containerboard industry. Understand the projected demand for your products in different regions. Identify and evaluate potential investment opportunities on a global and regional scale. Where will OCC demand growth come from in the future? How will local containerboard producers secure their OCC supply? Which regions are expected to see new virgin containerboard/ UKP capacity? How will the recycled/virgin fiber balance of world containerboard sector develop under different scenarios? Will we encounter OCC scarcity, much like conditions in 2011? A 10-Year forecast of pulp imports and production in China with an in-depth market update. The 2015 edition features new policies, updated cost analyses of nonwood pulp mills in China, as well as current capacities and closures. This study provides a unique and definitive insight into global developments in future recovered paper availability and markets. Provides information on 120 countries including forecasted paper and board demand/output, recovered paper demand, trade, recovery and recovery rate — by country and grade. Fastmarkets RISI’s monthly Monitor of benchmark prices and trade provides a current market snapshot and a two-year price forecast of key recovered paper grades: old corrugated containers, high grades, old newspapers, mixed papers.